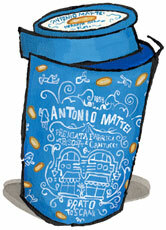 Antonio Mattei Almond Biscotti in Blue Tin for sale. Buy online at Zingerman's Mail Order. Gourmet Gifts. Food Gifts. Just outside of Florence, the small town of Prato is home the Mattei family, who have been making biscotti at their bakery since 1858. They use Puglian almonds (almost 20% of the total weight) and pine nuts from Pisa (not the cheaper Chinese variety). Unlike the disappointing, dry cookies found so often in cafes in the US, these are jam-packed with rich, nutty flavor. We've sold these biscotti for years in a handsome blue bag. Brand new this year, the Matteis have also started offering the same cookies in a gorgeous, keepsake-worthy blue tin.